Creative Learning Arts School is proud to provide parents in Bethesda with high-quality preschool and daycare services. Our educational environment is one that encourages your child’s development, and our entire staff is committed to providing your child with the best education possible. To learn more about how our Bethesda daycare and preschool can best serve the needs of your child, contact Creative Learning Arts School today! In part one of our blog series, we talked about a few of the benefits that your child can enjoy from studying a foreign language. From being able to communicate with a larger amount of people to improving their English skills, children who study a foreign language can enjoy a variety of benefits. Concluding our blog series in part two, here are a few more benefits that come with learning a foreign language. Students who learn a foreign language at a young age have a better chance of either sticking with it or picking up other foreign languages as they grow older. As stated in our previous post, learning a foreign language allows your child the ability to communicate with more people than if they only spoke one language. This ability to communicate with non-English speakers is not only enriching to their overall worldview, it can also be beneficial to them in the future. With the diversity of our country only growing, skills like these can be incredibly useful on a professional level as well. Being able to communicate with more than just English speakers is a resumé-worthy quality that many employers take into consideration when looking at applicants for a position. Being able to speak languages like Mandarin, Arabic and Spanish will prove to be incredibly useful to your child as they grow older, and by having them start off at a young age can put them on the right path from the start. 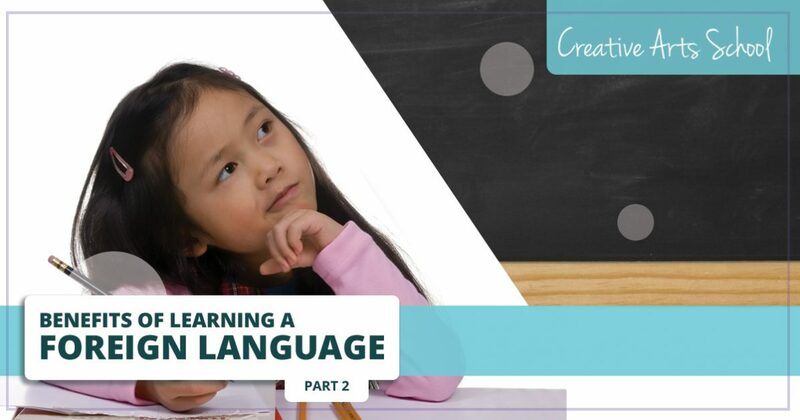 Because learning a foreign language is similar, though not identical to learning English, there are certain processes involved that your child can only experience if they choose to learn a second language. Multiple studies have shown that people who speak more than one language demonstrate higher levels of creativity and overall better problem-solving skills than people who only speak one language. In learning a foreign language and experiencing these specific processes that are unique to doing so, your child is more likely to approach other parts of their education with a sense of creativity. Being exposed to other cultures will help your child see that there is more to the world than their own backyard, so to speak, and this idea of multiple cultures and perspectives can help your child in being able to see multiple paths and options to reach a desired outcome. Learning a Foreign Language is Fun! For kids, school is much like a box of crayons – multiple colors that all serve different purposes. They have their preferences, in that they prefer some subjects over others in the same way that they prefer certain colors over others. With this in mind, there must be a balance, and for any child, there are times when school can be difficult, frustrating or not enjoyable. Learning a foreign language can be a fun break from an otherwise traditional school day, as it gives your child a chance to not only learn to express themselves in a way that they were unable to do so before, it also helps expose them to the culture and customs of its speakers. Starting your child off young will help them excel much quicker, and it can also establish the idea of that learning about new cultures is fun, because it is! Those are a few more examples of some of the advantages that your child can experience from learning a foreign language. At Creative Learning Arts School, we pride ourselves on providing your child with a unique educational environment that’s unlike others in the area. From our Spanish and Russian immersion classes, to our curriculum that focuses on art, music and other creative pursuits, we are committed to your child’s success and development. To learn more about how our Bethesda daycare and preschool can help your child succeed, contact Creative Learning Arts School today.